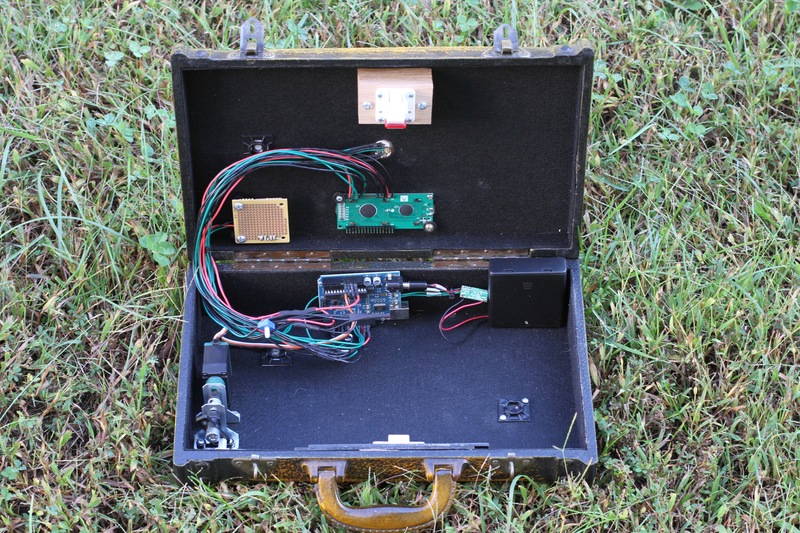 This box contains a microcontroller that keeps the box locked from the inside until its GPS sensor detects that the box is located at coordinates I can specify beforehand. Basically, I program the box for a certain location and lock a treat inside. I give the box to someone and they get to figure out what the box does and how to multilaterate the position the box “wants” to reach. Most of the time, the box is in a very-low-power sleep mode. Pushing the doorbell button on the front wakes up the microcontroller and the box attempts to acquire a signal with it’s GPS receiver. 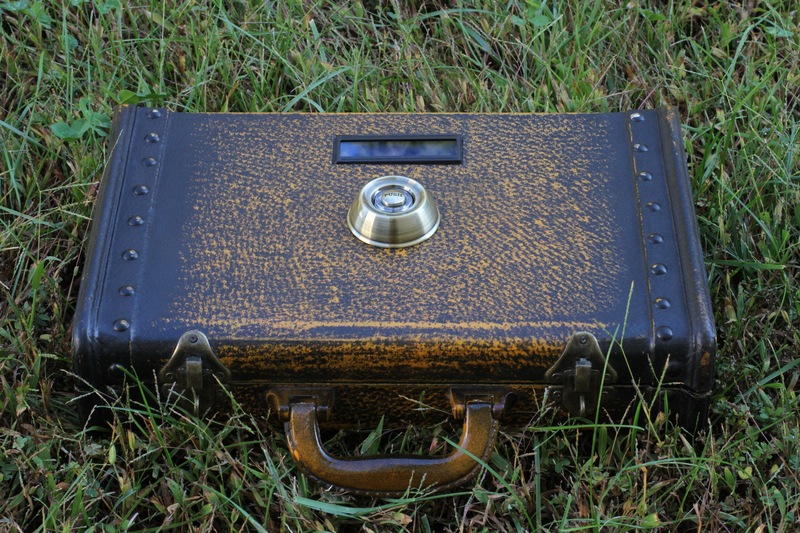 Once the location is determined, the box runs some math to calculate the distance to it’s secret location. If the distance is within the threshhold (usually a tenth of a mile or so, depending on the location I pick), the box congratulates the recipient and unlocks its interior latch. 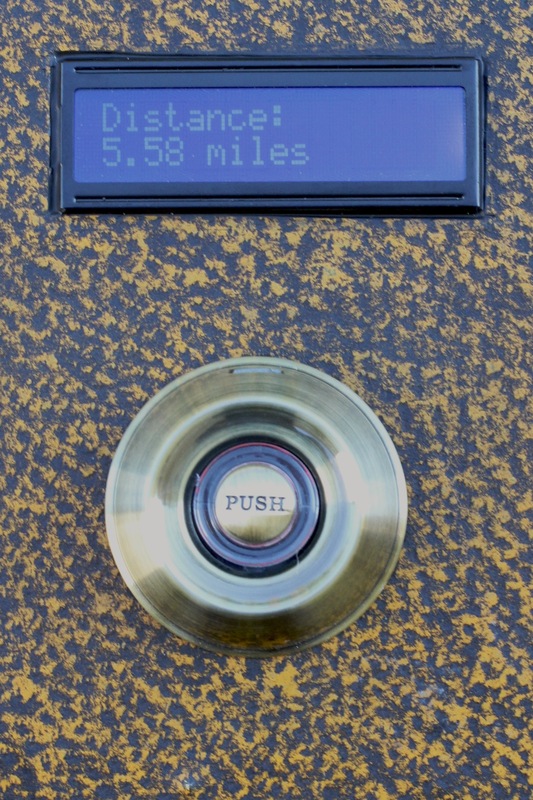 If the distance is too far, the box replies with “Access Denied”, tells the recipient how many attempts they have remaining (after 20 button presses, the box locks permanently), and then displays the distance to the desired location. Eventually, the recipient should figure out that they should travel to different locations around town to push the button and draw some circles on a map to see where the distances intersect. On the top of the exposed lid you see a magnetic child safety cabinet lock that I repurposed to use a backdoor in the event of a malfunction or a failure to locate the secret location. Down and to the left is an EM-406A GPS module from SparkFun Electronics. To the right is the 16×2 LCD that Adafruit sells for just $10. Moving to the bottom portion of the box, most of the wires lead to the Arduino Duemilanove board. To the right of that is a small circuit board that comprises the Pololu Power Switch that lets the Arduino disconnect its own power. Right some more you see the black Radio Shack battery case. I had to switch to a solidly enclosed version because the open type let the AA cells fall out too easily. On the left side of the bottom portion of the box I mounted a servo I had leftover from a Vex robot kit. The servo drives a latching mechanism I designed and built using sheets of PVC. The top lid latch engages the keeper on the bottom, unless a strong magnet disengages the lid latch or my servo slides the keeper to one side upon the solving of the puzzle. When testing my reverse geocache, I found that it was rather tricky to solve, logistically speaking. I figured that the recipient of the box would simply grab a map, drive a fair distance, push the button, draw a circle of the radius specified by the box’s “Distance:” clue, and repeat until they had multilaterated the desired position. Simple, right? Turns out the trickiest part was drawing the circles. Even if you have a paper map that covers the area in question, you probably don’t have a compass that can draw a big enough circle. It isn’t any easier to do within Google Maps or Google earth. 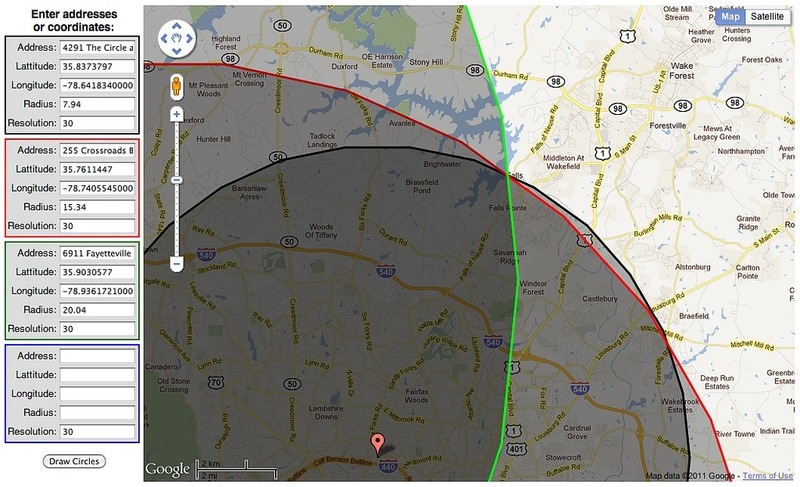 There are sites that will draw you one circle on Google Maps, but I could find none (as of December 2010) that would overlay multiple circles. So I wrote my own. Please note that I made this only for the creator of the box to use in quickly and thoroughly testing the accuracy of the math. I did not write this page to lessen the challenge for recipients of reverse geocaches.